Ancient Shapes appeared in my inbox in January, a surprise in more ways than one. Romano had described it as an experiment, a record he made over the holidays. He was bored, and he started playing drums again, and he started writing songs on top of the drums he was playing and recording. And then, I receive this record, 14 thrilling, dense minutes of exuberant, unusual, excellent punk music. And I just plain liked it, unabashedly. It’s a record that, quite simply, makes me smile. I don’t know anything about punk music, and cannot place this record within a tradition that I know many people have poured their lives into. It certainly has the spirit of that genre – brash, fast, rebellious – it is punk music, but suffused with a poetic wordplay and imagery and melody that places it in an entirely different space. It’s also very much pop music, very approachable. Taken alone, without any of Romano’s previous work, I imagine it would be heard as an exciting debut, an experiment within the genre. Though as I say, I know very little about punk music- maybe there are a hundred punk bands in Canada writing punk songs about ‘the dance of the blossoming selves’. If there are, I hope I am educated. As noted above, this record was made, apparently, drums first, songs second. It’s ridiculous that it turned out so well. It’s a rare record that carries with it the joy of inception, and this one does. It feels like someone rediscovering music, shouting a million spontaneous lyrics, if your spontaneous lyrics were good, as they so rarely are. He opens shouting ’tonight I’m gonna wear my chinese t-shirt, tonight I’m gonna put a blanket over my scars, tonight I’m gonna find a big volcano and jump to the bottom just to prove how lucky we are’ on ‘Public Hymns’, and then follows it up ‘Ancient Shapes’, where he gambols lyrically through a room ‘ballistic with cinder and ashes’ and ‘the difference in every strand of her hair’, where the chorus and verse feel like different keys, there’s a bridge, another bridge, and then a key change, and then the song is over, 57 seconds later. All the songs have a staggering number of hooks stuffed in to a dizzying short run time – you can fit the whole record on the single side of vinyl but there’s enough ideas to populate a lesser band’s entire ouevre; see ‘Hurricane Lady’. I’m fond of ‘I’d Put Every Tear Back In’, as Romano sings ’I cry, every time I go out, any time I think about anywhere my hurt’s been, I wanna put my tears back in’ and it’s funny and sad and kinda bratty – a child’s retort to reason – a young man, posturing invulnerability. When he asks ‘Does anybody got a Mac stick?’ I laugh, a reference to concealer lightly transgressive in a punk song sung by a straight man. ‘Someone Always Blushing’ has one of the more undeniable melodies on the record, a poignant chorus, ’even in the hopeless light of morning I can see you on the steps’, and I find it one of the more emotionally evocative Romano songs in recent memory. At times Ancient Shapes has a quality which Romano’s music rarely has, a quality of the unknown, the incomplete, a reaching towards something not quite understood or grasped. As Romano sings on track three: ’on a night as porous as this, I found myself at the gates of a new dawn; awoke and in love with electric mystics, it’s a dance of the blossoming selves’. Sometimes the records you like the most are the ones you find most difficult to explain. 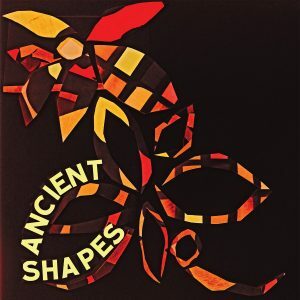 So I’ll say again that Ancient Shapes is a record that makes me smile, and most music that is intended to make people smile has the opposite effect on me – I grimace through shopping malls. Music that makes me smile does so because it is alive and full of ideas, because it is irrepressible, because it is unusual. It makes me smile because I can hear the human on this record, the spark and dust of life, the thumb in the eye nature of creation.